*Capacity is dependent on quality and type of seed, moisture, whether de-hulled or not, whether ground, conditioned etc. Segmented screw, bars and rings. Hopper size Approx. 80 lt. Check that the rollers are correctly set as required. Check that the adjusting screw lock nuts of the adjustable roller are properly secure. Make sure excessive dust and dirt is removed from the screw thread of the adjusting screw. Make sure that the feeder hopper slide is closed before filling the hopper. Ensure that all safety covers are closed. NOTE: A badly tensioned v-belt drive will influence the turning speed of the roller, which has a big influence in the effectiveness of the flaker roller. Make sure that the hopper is free of any foreign matter. Set the varispeed unit to its lowest setting. Make sure the outlet of the auger is placed over the heater to prevent spilling. Ensure that the forward and reverse selector switch is set to forward. Make sure that the heater pan is free of any seeds and that it is clean. Note: Caution should be taken when the heaters are switched on, as this unit gets very hot. Make sure that the inlet of the oil expeller is clean and free of any seeds or foreign matter. Note: It is prohibited to start the oil expeller if there is no clearance between the cake adjusting head and cake discharging ring. When starting the feed should not be too rapid. Metallic matters are prohibited to enter the squeezing chamber. The feeding inlet should not be poked by metal bar. Ensure that the inlet is free of any foreign matter other than mustard oil cake. Ensure that all clamps on the ducting are secured properly. Make sure that the filter bag is clean and the clamp is secured properly. Note: Do not clean the inlet by hand if the blower unit is switched on. Metallic matters are prohibited to enter the blower unit. Oil cake that is stuck in the inlet is not to be poked by metal bar. Ensure that the collecting bin is free of foreign matter other than mustard sludge and oil. Ensure that the spinner lid and front cover is closed. Note: The micro switch on the spinner should not be tampered with as this may cause a change in sequence. No special precautions have to be taken before starting this unit. Note: Do not try and clean the rotary vanes by hand if the machine is switched on this will cause serious injuries. No metallic matter is allowed to enter the rotary valve. Ensure that clutch handle is disengaged and that the stone is turning freely. Do this by turning the drive pulley by hand. Ensure that the feeder is closed. Make sure that outlet one is open and a bag is fitted on the outlet. Ensure that no foreign matter other than mustard cake is in the hopper. Note: Do not try and clean the outlets by hand if the machine is switched on this will cause serious injuries. No metallic matter is allowed to enter the stone mill. Ensure that the pressing screw is tightened. Ensure that the oil pan is clean. Note: Do not press too hard it might distort the front and rear supports and will cause excessive leakage. After all of the above checks have been done the start up of the plant can commence. 1. Switch the main power selector to the on position. 2. Fill the hopper of the flaker roller. 4. Open the feed of the flaker roller to the required position. 5. Fill the oil press feeder hopper to its maximum level. 6. Close the feed of the flaker roller and shut off the flaker roller. 7. Switch on the pre heater and adjust to the required temperature. 9. Start the oil press. 10. Start the rotary valve. 11. Start the blower unit. 12. Start the stone mill. 14. Switch on the pump for the raw oil tank. 15. Start the oil press feeder, adjust the speed to 30 % and fill the pre heater. 16. Switch off the feeder when the pre heater is full and wait until the seeds are heated. 17. When the required temperature is reached switch the oil press feeder on and make sure it is at 30 %. 19. Check the oil extraction and cake quality. 21. Open flush valve mounted on top of the expeller to rinse away the sludge. 23. Adjust the stone mill until the stone are just touching then engaging the clutch handle. 24. 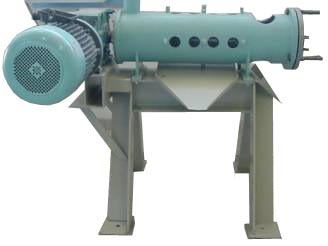 Open the feed of the stone mill to its required position. NOTE: The pump on filter one is feeding the two filters installed from the raw oil tank. The pump on filter two is transporting the cleaned oil from both the filters to the finished product bins. Each filter consists of 15 filter plates and 14 filters. The filter plates should be covered with filter cloth on both sides. Behind front support the first filter plate is mounted, following it the first filter frame and the other filter frame and thereafter the rest of the frames and plates. The last one to be mounted is the pressing plate, which should be tightened securely by the pressing screw. The filter cloth should be smoothed out. No corrugation is allowed. Oil will be emitted from corrugated parts. Do not over tighten pressing screw. Over tighten may damage front and rear supports. Tighten only as specified in training. An oil return valve is installed on the oil pipe for moderating oil pressure valve 1 and 5. 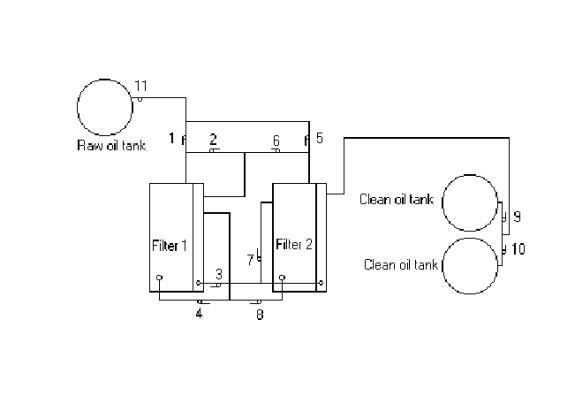 Before starting the oil pump, the valves 1,5 and the oil-taps on filter plate should be fully opened. After oil pump is started, slowly shut of the valve when oil runs smoothly thru oil taps. (Slight oil perspiration is normal). Valve shut-off should be stopped. The oil press filter should now run at its optimal. As operation time increases, residues accumulated on the filter cloths increase, and so does the oil pressure. If the oil pressure increases the valve should be opened slightly, keeping oil pressure below 0.5 Mpa. 1.Open valve 11 on the raw oil tank. 2.Open valves 1 and 2 before starting filter pump 1. 3.Open taps on side of filter and check oil for quality. 4.Open valve 9 or 10 to finish product bin. 5.Open valve 3 and start filter pump 2 to feed clean oil from filter one to finished product tank. 6.When oil starts to flow out of the taps on side of filter close valve 1 slightly. 7.Open valve 5 and 6 to start filter two. 8.Open taps on side of filter two and check oil quality. 10.When oil starts to flow out of the taps on side of filter close valve 5 slightly. 11.If there is oil build up in spill tray of filter 1 and 2 open taps 4 and 8 to empty tray and pump oil back to the raw oil tank. Note: The machine should be kept clean regularly. The filter plates, filter frames and pressing plate should be handled with care in order to avoid damage. It is prohibited to press the hold down screw with pressing rod. The pressure should be controlled only enough to keep filter cloth tight and smooth and to make sure there is no oil emission (slight leakage is normal). All the connecting parts should be checked regularly to ensure that they are not loose.